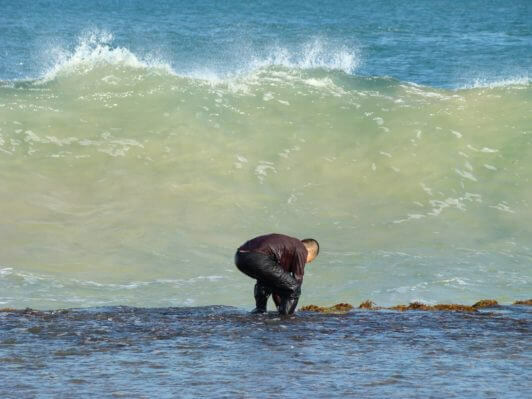 Recfishwest and Surf Life Saving WA are urging people to remain mindful of the conditions and take personal responsibility for their actions through the abalone season which begins this Sunday, November 1. The popular West Coast Zone abalone season sees thousands of recreational abalone fishers take to the inshore reefs around the metropolitan coastline, during the one-hour fishing periods from 7am-8am on the first Sunday of each month until March. Recfishwest Chief Executive Officer Dr Andrew Rowland said abalone is one of the most sought after shellfish with over 15,000 licence holders taking part in the fishery each year. “We urge abalone fishers to exercise caution whilst fishing and to be aware of the weather conditions. This outdoor activity is a great way to spend the morning with the family as long as it is carried out safely’’ Dr Rowland said. Surf Life Saving WA reports that in the past four years, three people have lost their lives whilst abalone fishing in WA. “Three drowning deaths in just four years is an alarmingly high figure for just one coastal recreational activity,” explains SLSWA General Manager Chris Peck. “If you think the conditions look dangerous, your swimming capabilities aren’t strong enough to get you out of danger, or you’re not properly equipped with the right gear – don’t risk your life and the lives of others.” pleaded Mr Peck. 1. Check conditions – before heading out check weather conditions, including wind conditions and swells. Visit www.beachsafe.org.au for up to date reports or download the free Beachsafe App. 2. Observe first, fish later – do not attempt to fish if you are unsure. Read the warnings and dangers on any safety signs. 3. Wear appropriate clothing or wetsuits – Avoid heavy clothing, including tracksuits and work boots that become water logged and heavy. 4. Never fish alone – stay in a group and keep an eye out for your friends and other fishers. 5. Don’t panic – if in trouble stay calm and raise one arm and wave from side to side to attract attention. With so many recreational fishers accessing the resource, Dr Rowland encouraged fishers to abide by size and bag limits in the West Coast Zone to ensure this iconic species remains sustainable well into the future.